Slate roofing is durable and can enhance the look of your property and boost the price of your house should you decide to sell it someday. This material has been used for centuries and quite a few such roofs you can see in Toronto are several decades old, despite the fact that they look like new. 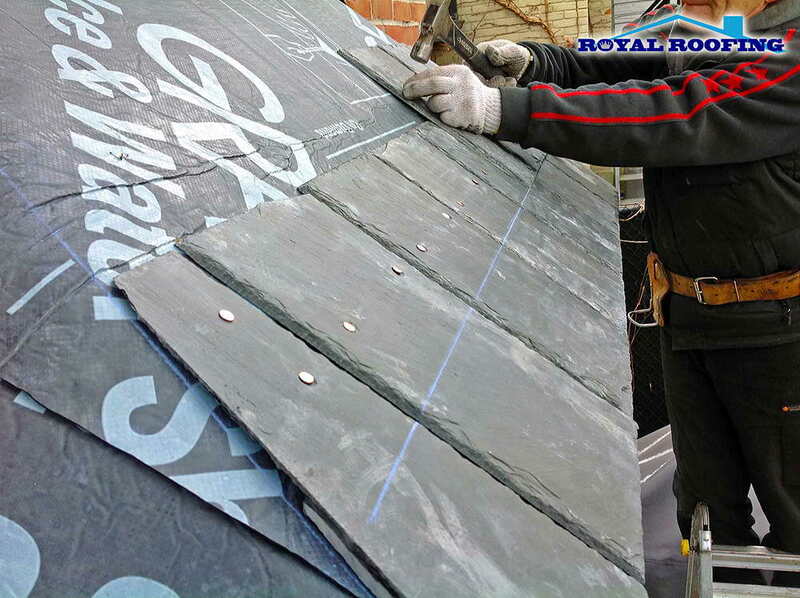 At Royal Roofing Inc., we offer a wide range of slate roofing options that have different colors and designs. We guarantee quality installation, maintenance, and repair services for any type of slate roof. Do you doubt whether a slate roof is worth investing in? Check out the list of benefits it provides and you will understand why this material deserves the extra cost. If installed and maintained, this roofing system can last through generations with minimum expenses on regular service. Calculate the costs of replacing a cheaper asphalt shingle roof every 15 years and you'll see that it is well worth its price and is beautiful. It truly looks unique and attractive. Many shingle colors are available, and the creation of synthetic slate increases the range of designs even more. It will make any house look sophisticated and luxurious. Toronto rains and snowfalls will not harm your roofing. Having a low water absorption rate, it fares very well in low temperatures, meaning that the rate of natural roofing deterioration is greatly reduced. This material is resistant to storms. Simply saying, it is exceptionally strong, this is why it's heavy. With this type of roofing system, you won't need to worry about expensive wind damage roof repairs since only a huge storm presents any danger to it. Nothing is perfect, not even this exceptional roofing material. You need to be aware of its cons to decide whether this is the best choice for you. It's not recommended to be used for roofs of specific configurations that have weaker support systems. Our experienced technicians will assess the state of your building to determine whether it can support a quality slate roof. When you consider the life expectancy and durability of this system, you'll see that it's cost-efficient. However, it requires a significant initial investment. Nowadays, you can find several types of synthetic slate, an affordable alternative to the natural material. These products are designed to imitate the appearance and durability of the natural one, but none of them can match the original 100%. 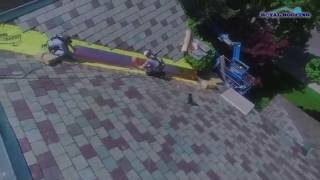 These polymers may be a good choice for people who want to have such a roof but cannot install it due to the buildings or financial limitations. The pros of these systems include affordability and ease of maintenance. Their cons are a shorter lifespan and lower level of protection since they aren't as fire, water, and weather-resistant as natural ones. Over the hundreds of years it has been in use, natural slate has proven to be an amazing roofing material. It's true that it's expensive, but this is a system that can serve well for generations and will increase the value of your property greatly. At Royal Roofing Inc., we have a team of experienced Toronto roofers who can design the best configuration for this type of system based on the building's structure. We can install it quickly and provide you with regular maintenance service that will allow you to prevent any problems for many years to come. We can service and repair older roofs to help you increase the lifespan of this construction. Slate roofing offers exceptional durability, as it is not prone to damage by extreme temperatures and is resistant to chemicals, alkalis, and acids. It maintains its natural color, even if it is exposed to a significant amount of UV light, and is impenetrable by water if installed correctly. Most of the time, Welsh roofing slates are removed from the roof after up to 100 years of service, as the roof timbers fail. It can then be reused for new roofing purposes. For instance, the Penrhyn slate from the roof of St Asaph’s Cathedral was removed 400 years after being installed, and was then reused. Royal Roofing Inc., provides its clients with the following types of slate roofing: Welsh, Chinese, Spanish and Brazilian. True slate shingles are produced from metamorphic rock and are extremely tough. Nevertheless, it is possible to split them into thin layers that comprise individual slates. Usually, true slate shingles are uneven and of irregular sizes. Welsh ones are an exception, as they have a smooth surface and are of regular sizes. They became popular as railroads entered the network of global transportation systems. While installing a slate roof the technician should use a brick bond pattern. In other words, the joints between each one should be adjusted with the center of the above and below slates. This leaves space between the sides of about 3mm allowing double covering since the top part of each slate is covering the center of the one in the next row and the lower part of the one located above. The amount of overlap is dictated by the roof slope. The steeper it is the less overlap is required. Shorter roof slates are used in the composition of the lowest row of roofing near the fascia board to provide the double overlap for the first row of full-sized slates. As such the lower edges of these short ones should coincide with the first row of the full ones. The top row at the ridge of the roof is composed of half slates for the same purpose. The top edge of the first row down must be covered with a ridge tile. Instead of galvanized nails aluminum ones should be used since aluminum does not corrode. Hence copper and stainless steel nails are acceptable. They can be nailed either at the top or the center. In case the nail is at the top it is covered by two slates limiting disclosure. yet since only one end is secured more risk of breakage and wind uplift arises. Alternatively, when the nail is deposited at the centerline of the slate the protection to the nail is decreased. Nevertheless, it should be noted that the risk of slates being lifted by strong winds is diminished. In general, the ultimate way to compensate for added exposure is to nail the slates right at their center.